Summary: The Canadian CT Head Rule head rule will permit physicians to standardize care of patients with head injuries and to be much more selective in the use of computed tomography without jeopardizing patient care. Recently validated at nine Canadian sites and now the subject of a large CIHR-funded implementation study. The physician's dataform used in the validation study is available for review. Available in several formats here. Stiell IG, Clement CM, Grimshaw JM, Brison RJ, Rowe BH, Lee JS, Shaw A, Brehaut J, Holroyd BR, Schull MJ, McKnight D, Eisenhauer MA, Dreyer J, Letovsky E, Rutledge T, MacPhail I, Ross S, Perry JJ, Ip U, Lesiuk H, Bennett C, Wells GA. A prospective cluster-randomized trial to implement the Canadian CT Head Rule in emergency departments. CMAJ. 2010 Aug 23. [Epub ahead of print]. Stiell IG, Clement CM, Rowe BH, Schull MJ, Brison R, Cass D, Eisenhauer MA, McKnight RD, Bandiera G, Holroyd B, Lee JS, Dreyer J, Worthington JR, Reardon M, Greenberg G, Lesiuk H, MacPhail I, Wells GA. Comparison of the Canadian CT Head Rule and the New Orleans Criteria in Patients with Minor Head Injury. Journal of the American Medical Association. 2005 Sep 28;294(12):1511-8. Stiell IG, Wells GA, Vandemheen K, Clement C, Lesiuk H, Laupacis A, McKnight RD, Verbeek R, Brison R, Cass D, Eisenhauer MA, Greenberg GH, Worthington J, for the CCC Study Group. 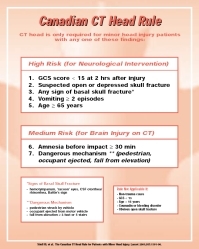 The Canadian CT Head Rule for patients with minor head injury. The Lancet. 2001 May 5;357(9266):1391-6. Stiell IG, Lesiuk H, Wells GA, McKnight RD, Brison R, Clement C, Greenberg GH, MacPhail I, Reardon M, Worthington J, Verbeek R, Rowe B, Cass D, Dreyer J, Holroyd B, Morrison L, Schull M, Laupacis A; Canadian CT Head and C-Spine Study Group. The Canadian CT Head Rule Study for patients with minor head injury: rationale, objectives, and methodology for Phase I (Derivation). Annals of Emergency Medicine. 2001 Aug;38(2):160-9.